I have quite a few Beginner Observations that I could tell you about. But adhering to the adage, “if everything is important, nothing is important”, I will just share with you the top three, most important to me, observations. Beginner Observation #1: Beginner means beginner. 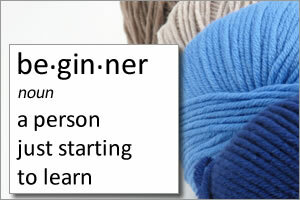 To the authors of those books for beginner knitters and to all those, like my avid knitter wife, that teach beginners how to knit, what is it about the word “beginner” that you obviously don’t understand? Beginner means beginner. Beginner does not mean someone that has already been exposed to the craft, that already knows the terms, and that has some degree of knowledge about what things are supposed to look like and how things work. Beginner Observation #2: Don’t assume I know what I am looking at or understand what you are telling me. As an author or a teacher seeking to help a beginner knitter, assume that I know absolutely nothing. Nada. A good rule of thumb for teaching a beginner, a real beginner, is that they don’t know what they are looking at and there is a very good chance that they don’t understand what you are telling them. As an author or teacher, you know a lot of things, but what you don’t know is what your student knows. So don’t assume that; start from the beginning. Trust me, I will not be insulted if you tell me something I already know. Got it? Let me give you an example. In my Knitting Made Easy book, there are six steps for Casting On, but I could not get past Step 3. I challenge you to read Steps 1, 2 and 3, shown below, and see if you can figure out where I was going wrong. Remember, I am a rank beginner. Step 2: Insert right-hand needle through the slip knot and pass the yarn over the right needle. Step 3: Pull a loop through. Did you spot where I had trouble? Or, because of your advanced knowledge of knitting, are you unable to see what was so basic and problematic for a beginner like me? I made a slip knot and I happened to be holding it in my right hand. Since I was holding the slip knot in my right hand, the first thing that I did in attempting Step 2 was to put the slip knot in my left hand. Then, as instructed, I inserted my right-hand needle through the slip knot. At this point, with only the right-hand needle through the slip knot, I passed the yarn over the right needle, as per the instruction. Now just how do I do that? How do I pull a loop through? My left-hand needle has yet to be inserted into the loop as per the instructions in the book that I am reading and trying to follow. Since only my right-hand needle has been inserted, am I supposed to somehow snag the loop with my yet to be involved left-hand needle? Do you see and understand the problem that I am having with these three instructions? After failing to get past Step 3, I finally called my avid knitter wife over to help me out. I asked her to stand behind me and watch what I was doing as I followed the instructions. No sooner had I put my right-hand needle through the slip knot did my wife start cackling. Eventually, after she laughed herself out and came up for air, she explained to me that after you make your slip knot in Step 1 you then start Step 2 with the loop of the slip knot already on your left-hand needle. Until the loop of the slip knot is on your left-hand needle, you can’t do Step 2. Everyone knows that, dummy. Well, not this everyone. And by the way, what am I looking at and what should be the orientation of that which I am looking at. For example, is a loop and a stitch the same thing or are they different? And what about the position of the loops and stitches. Do the loops have fronts and backs or do they have right-sides and left-sides? Same goes for stitches. Do I insert my needle into a stitch from left to right or right to left? Or do I insert my needle into a stitch from front to back or back to front? And as I work, do I hold my needles in an upward, vertical direction or do I hold the needles in a more flat, horizontal direction? As a beginner, these are the kinds of things that I do not know and that I am struggling with as I try to read the instructions and follow the various steps. Am I supposed to magically know this just because I want to learn to knit? Or am I supposed to figure this out via trial and error and, I might add, a bit of frustration along the way? Beginner Observation #3: Don’t just give instructions, give me tips. When you are teaching a beginner, another good rule of thumb is that for every step, such as an instruction, you should provide at least one or two tips for such things as how to do the step, what’s important to get right, and what you should avoid. A good example of that is in explaining the importance of maintaining your yarn tension as you hold the yarn, how it affects your work, and what happens if your tension is too tight or too loose. Well, not my little finger. It’s not holding or gripping anything. As hard as I try, I can’t get the fingers in my right hand to work. How do I hold my right-hand needle and hold the yarn and grip and release the yarn as needed? And when I am knitting, when do I grip and release the yarn? Is the yarn supposed to slide through my fingers or do I have to release and then re-grip the yarn? What about the yarn tension from the yarn in my hand to the yarn on the skein? Am I supposed to pull yarn off the skein and maintain a working amount of slack so that there is no tension in the yarn between the skein and my hand? With all of that tension I had, no wonder my Cast On was so tight! And by the way, saying that I am supposed to hold my right-hand needle like I hold my pencil just doesn’t do justice to all that is involved in getting the fingers in my right hand to do their job. Well, I could say more but don’t get me wrong, I am a happy camper and still very committed to learning how to knit. And, I actually do like knitting. It’s fun. And already, I have been able to make some beautiful and useful things. But, I can see how a true beginner might give learning to knit a try and then quickly give up. 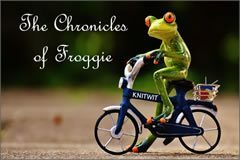 For what it is worth, dear authors and teachers, these are my initial Beginner Observations.